Maintaining your Allen, TX lawn and landscape in top-notch condition is our number one goal . We are proud of our reputation for superb service, strong local knowledge and competitive prices. Granulawn is family owned & operated, and we stick to the belief that every customer deserves personal attention ! Our applicators receive considerable training before they ever see your lawn. They are certified and trained to detect troubles before they become significant . Why do Allen, TX homeowners use a Lawn Service? There is a lot more to growing a healthy, beautiful lawn in North Texas than merely cutting and watering. If you’ve visited your neighborhood home improvement store, you already know how confusing and difficult lawn care can be. To get the professional results you want, hire a professional with the experience you can trust – Granulawn. Our expert applicators will make sure the correct mix of products are used for optimum results. Our certified, trained applicators know how to detect and treat problem areas before they spread. Professional service and professional products can save you time and money! Did you know that quite a few of our customers in Allen, TX actually save money with our service versus the costs of Do-it-yourself? Proudly Serving Allen, Texas Communities since 1985 including within the 75002 and 75013 zip codes. 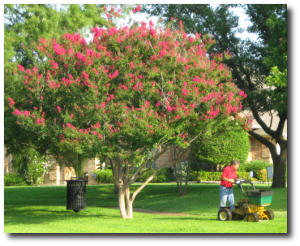 Call us today for all of your Allen, TX lawn care needs!